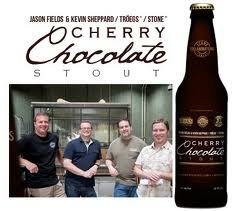 Escondido, CA — Stone Brewing Co. is rolling out yet another collaboration beer, with the “Jason Fields & Kevin Sheppard / Tröegs / Stone Cherry Chocolate Stout” due to hit shelves on July 25. San Diego homebrewing duo Jason Fields and Kevin Sheppard submitted their Cherry Chocolate Stout for this year’s Stone March Madness Homebrew Competition and AHA Rally, taking top honors out of 40 entries that were judged. As a result, they earned the opportunity to make a dramatically scaled up version with Brewmaster Mitch Steele on the 120-barrel Stone Brewing Co. system.